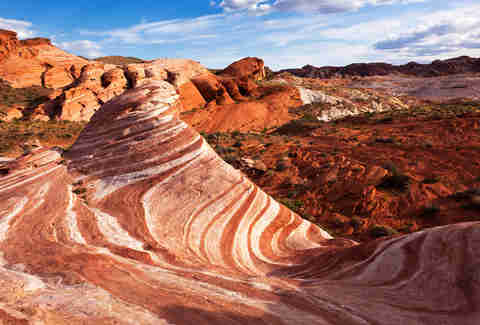 Las Vegas is an outdoor enthusiast's dreamscape. There are endless opportunities to enjoy nature, and this is especially true if you like hiking. And since the brutal heat of summer limits your options when much of the Valley is off-limits, we’ve put together a very cool list of the best winter hikes. This area is actually closed in the summer due to extreme temperatures, so there's no time like the present to check it out. It’s a six-mile gravel travel that leads past the imposing Liberty Bell Arch, past a WWII-era mine (and the remnants of an old mining cable car), and down to the tip of Black Canyon wihch overlooks the 1,000ft-deep Colorado River gorge. This trail is good for hikers of all abilities. Accessible through the Lake Mead National Recreation Area, the Arizona Hot Spring is located in a dramatic volcanic slot named White Rock Canyon, which takes its name from the huge white boulders that were carried down into the canyon from flash floods. Fractures in the volcanic rock form pools of water upwards of 120 degrees just 1,000 feet from the Colorado River. The trail descends into the canyon, which means the 586 feet of elevation gain is all on the way back, and there is a 20-foot steel ladder to climb at one point. Aside from that, it's a relatively easy 5.6-mile round-trip hike. Just be warned: if you're planning on soaking in the springs, keep your head above the water – the National Park Service and CDC warn of killer amoeba lurking in the springs. 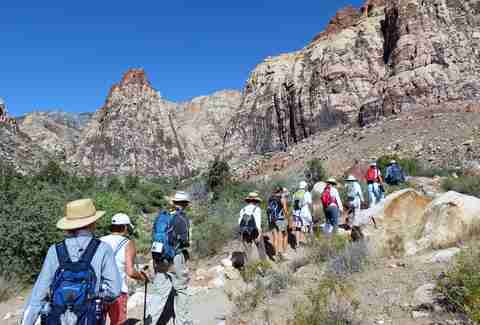 Red Rock Canyon is probably the best-known "outdoorsy" area in Vegas, and there are numerous class 2, 3, 4, and 5 scrambling routes in the Calico Basin -- for the hiker who enjoys a different kind of challenge. For a fun class 3 scrambling route that goes through an enormous crevice to a narrow ledge high above the Basin, hit Slab Rift. It’s a scrambling-intensive route full of massive boulders and fun obstacles for the intermediate scrambler, and best enjoyed with a group. 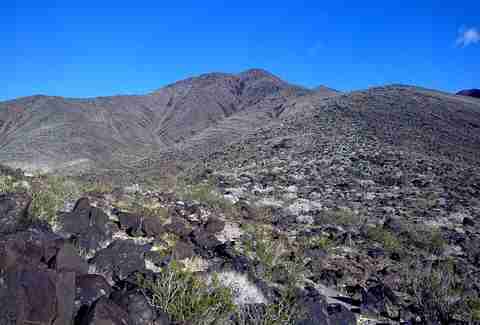 Frenchman Mountain, aka Sunrise Mountain, is the tallest peak on the eastern border of the Las Vegas Valley, and is certainly the most intimidating. At 4,055' with two twin peaks (alas, no Log Lady) and a deceiving false summit that drops 260' into the main saddle only to ascend another 700' for the true summit (for a total of 2,000ft of elevation gain), Frenchman is strenuous for even experienced hikers. However, the steep 2.2-mile gravel trail is easy to follow and doesn't pose many other challenges besides being really steep (and rocky). You'll have great views of the Las Vegas Valley from the summit, and the hike can be done in a few hours with plenty of viewing time at the top. The descent can be rough on the knees, so trekking poles would come in handy for this one. Black Mountain in the Sloan Canyon National Conservation Area on the south side of Henderson is another relatively easy peak to bag, with a straightforward trail all the way up to the top and some steep class 2 scrambling near the peak. You'll gain 2,100ft in elevation to reach the 5,092' summit, which offers a 360-degree view of the Las Vegas Valley as well as Arizona and California. At 7.6 miles round-trip, the length of this hike is what makes it the most strenuous. It can be done in three-four hours depending on your speed and is a damn good cardio workout. 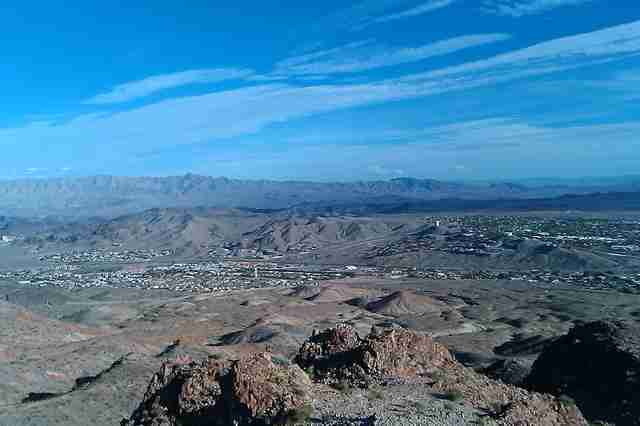 Fortification Hill offers the "best views of any peak in Southern Nevada," and we agree. 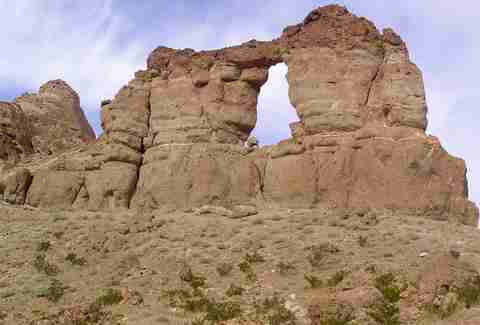 Said views include Lake Mead, Las Vegas, Mount Charleston, Mormon Mountains, Muddy Mountains, a range in Utah to the north, and the Hoover Dam to the south. This is a moderate hike with 1,500ft of elevation gain over the four-mile round-trip trail, though it's not consistently steep. There is a small stretch of class 3 scrambling involved, so this might not be good for beginners. The peak clocks in at 3,657'. 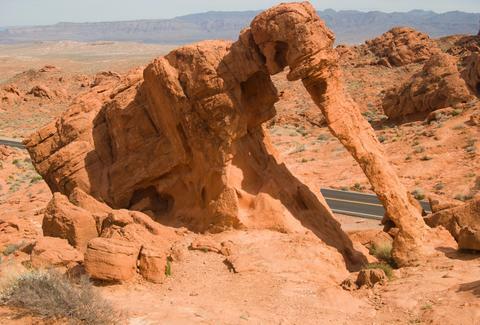 About an hour's drive from Las Vegas, Valley of Fire is Nevada's oldest and largest state park, with plenty of short, easy, picturesque hiking throughout. Some of the most popular trails are about one mile or under with minimal elevation gain, so you can do several in one trip. Don't miss the Fire Wave, White Domes, or Elephant Rock, and if you're up for a 6.7-mile hike to a spring that has water year-round, head for Charlie's Spring Loop. This loop has no shade whatsoever, making it very bad for summer but very good for winter. 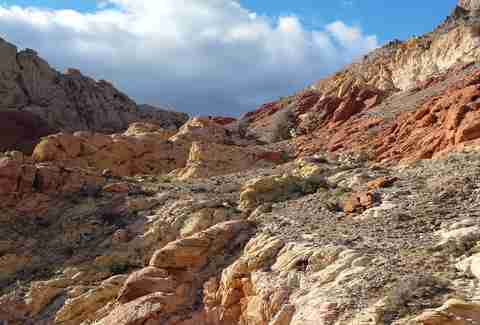 Kraft Mountain, located on the eastern edge of Red Rock Canyon, offers plenty of class 2 and brief class 3 scrambling, with 1,000ft of elevation gain to the 4,714' peak. The most direct route is a one-mile hike up and back, offering great views of the surrounding areas and a fun time on the rocks without being too strenuous (physically or psychologically). Alternatively there is the Kraft Mountain Loop, which skips the peak but still offers some fun class 2 scrambling and great views of seasonal pools and sprawling sandstone formations. This hot springs hike has become very popular in recent years, drawing in scores of locals and tourists. But be warned, it's not a super-easy hike. 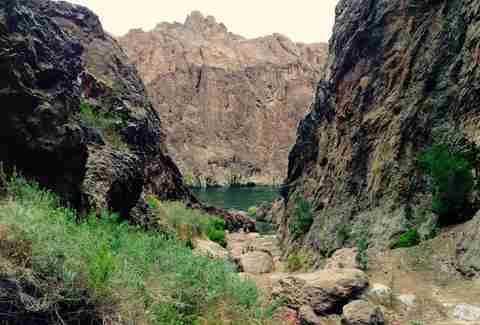 There are several fixed ropes on slippery rock you need to use, where massive boulders obstruct the narrow canyon passageway to the Colorado River, and it's about seven miles round-trip. The route to the Goldstrike Hot Springs in Boulder City starts out wide and flat, but gets more interesting as you get deeper into the canyon with house-sized boulders, vertical cliff walls of volcanic rock, and the rusted-out detritus of cars that have apparently careened off the above highway. Many of the Gold Strike pools have dried out due to earthquakes and flash floods over the last 10-ish years, so plan on hiking all the way down to the Nevada Hot Springs by the Colorado River if you want a good soak. And again, beware the killer amoeba. 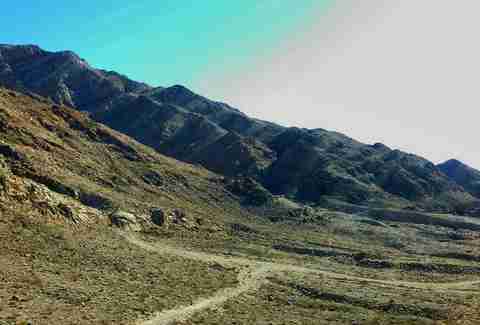 Not to be confused with the other Black Mountain, THIS Black Mountain is in Boulder City, and the mostly gently-sloping trail takes you from the trailhead past housing developments, through passages of rainbow-colored rocks, and into the canyon between Black and Red Mountains. 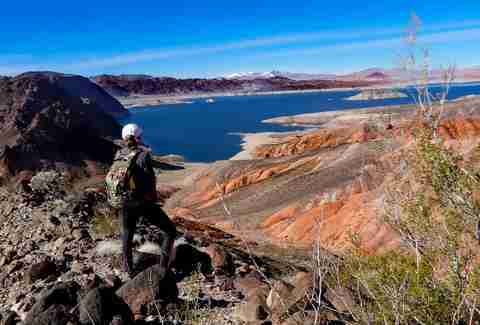 The trail gives you plenty of great views of Lake Mead as well as Las Vegas to the north and Boulder City to the south from the 3,526' summit. There is also a popular mountain biking trail that intersects with this hiking trail, for those of you who prefer life on two wheels.